Humans have always looked for role models and people that they can look up to and admire. The most successful gladiators in Ancient Rome’s famous arenas were practically worshipped by their fans. During the Middle Ages there were cults of saints that the masses followed and through the centuries, there have been numerous historical figures who still inspire us to this today: Cleopatra, Charlemagne, Louis XIV, Marie Antoinette - the list could go on endlessly. The icons of modern times are mostly culturally important thanks to their achievements in art, music and acting. Our artists have taken it upon themselves to create tributes to some of these famous people. At KunstLoft you can find handmade acrylic portraits of famous personalities - from Audrey Hepburn to Marilyn Monroe. With the portrait of a famous person, you can convey a strong message. You openly show your enthusiasm for the life and work of the icon while expressing your own passions. It is a courageous step, especially in your office, towards emphasising your individuality. At KunstLoft, you won’t find mass-produced, artificially made prints without a story. Our portraits are hand painted with love and bring the spirit of the person to life. 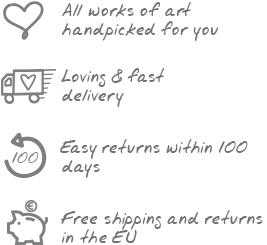 You’ll always receive high-quality, one-of-a-kind artworks from us at affordable prices. If you are looking to set trends with your art collection, browse through our preview section. We make it possible for you to preorder our latest exclusive artworks. Other than a wide selection of high-quality acrylic and oil paintings, you can also find handcrafted sculptures at KunstLoft, with which you can optically give your kitchen a little extra spice. If you’re looking to give someone the gift of art, our gift vouchers make it easy and you’re sure to hit the mark. The likeness of a famous person exudes unique charm. Marilyn Monroe, Napoleon or Michael Jackson — perfectly placed in a scene in a handmade painting. Bring these stars of the past into your living room as wall paintings. You and your guests will be delighted.